When putting tile in a small room, you want to lay the tile out in several different patterns to see which gives your room the allusion of looking bigger. Our space is a long and narrow L shaped room measuring 7′ deep x 6′ wide at widest point and almost 4′ at it’s narrowest. 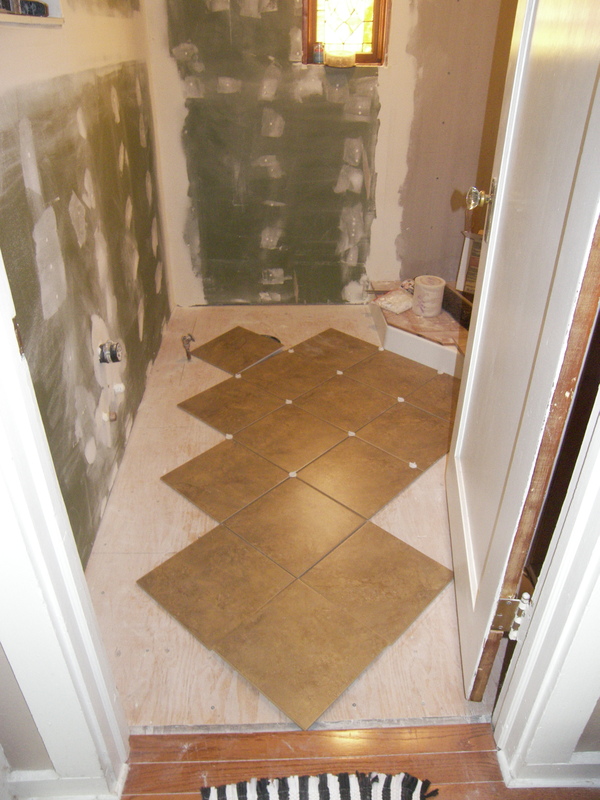 The picture on the top shows the 12″ tiles laid out in a typical square pattern. Here you can see that this pattern emphasizes its length and narrowness. The picture to the bottom shows the tile laid out at a 45 degree diagonal. Notice how it seems to add width to the room. Adding angles to your small bathrooms is a great way to fool the eye into thinking the space is wider then it really is. This angling of the tiles also mimics the 45 degree angle corner shower that was chosen to give more floor space to this small room. Repeating shapes in a room pleases the eye. 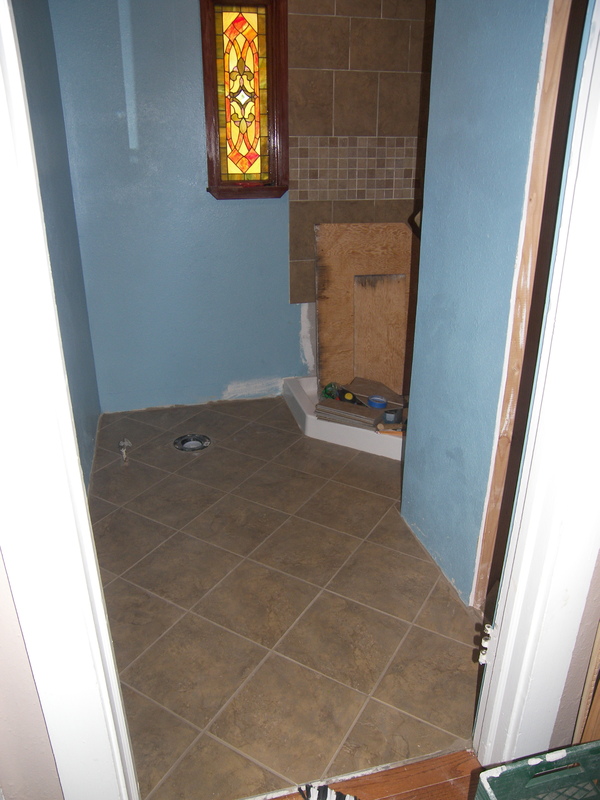 Laying tile is easy work that takes just a few inexpensive tools. The larger more expensive tools such as a cutter or saw, can be rented at your local rental store. 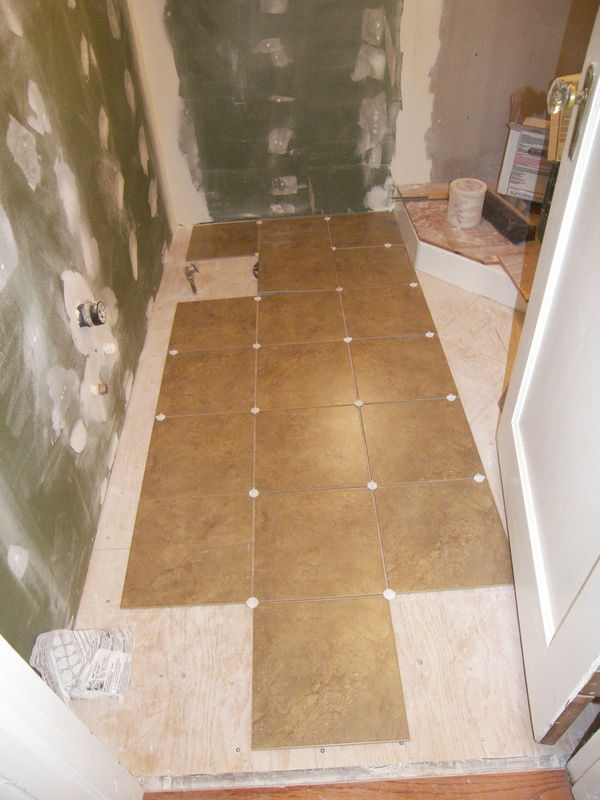 Do a little online research to learn how to lay and cut the tile. You will learn what tools you need and what they look like. Remember to start simple. To add floor space use a European style sink cabinet like this one or maybe a pedestal sink. Last but not at all least, consider placing your throne at a 45 degree angle. This way it is not facing directly at the side of the sink or straight into the shower, instead it brings the eye to the widest point of the room. When placing the throne at an angle remember you will need to place a wooden brace, in the corner, on the wall to support the tank from being pushed back. I like to place a corner shelf above the brace about the height of the tank lid or slightly higher, so that the space behind the throne is also a usable space. Every inch in a small bathrooms must be functional. use the space behind the throne to store your plunger and/or toilet brush where they are barely noticeable. 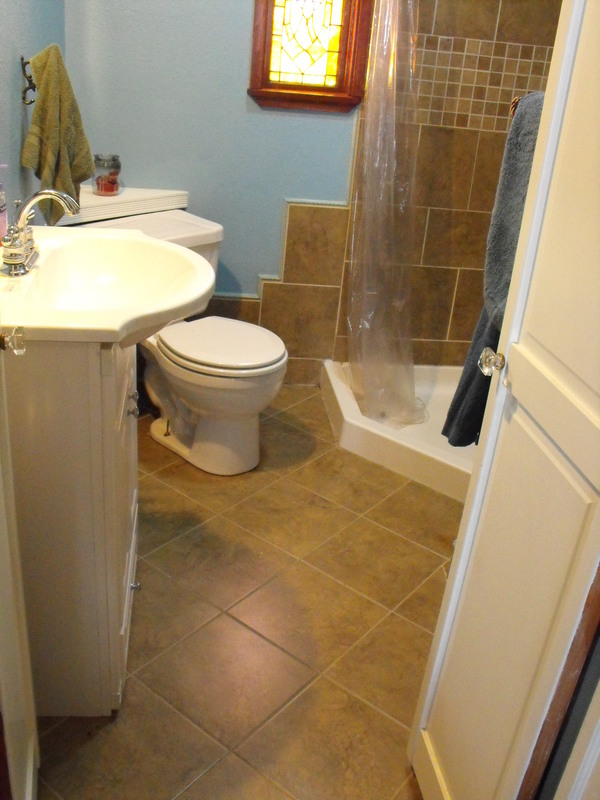 This small bathroom used to have a full sized door which came very close to hitting the sink edge. This made it difficult to go in and out discreetly. Make a new door by taking one solid bi-fold door the width of your existing door frame and removing the hinges that connect the two pieces. Then place hinges on the outside of doors so that instead of sliding closed, they close in the middle. In bottom picture, Notice the small decorative trim board placed to over lap the seam between the doors when doors are closed from inside.This will keep the doors from swinging to far out while creating privacy. A simple gate slide lock was installed to keep the door closed. Remember I said that “Every inch in a small bathrooms must be functional..” This bathroom had wasted space behind the door. Consider building a cabinet for towels that can be counter sunk into the wall. This is a 10″ deep shelf set into a 2″ x 4″ framed wall. Only 6″ sticking out behind door. It is perfect for storing everything you might need in your bathroom. Awesome job there Jackie. Our bathroom could use a remodel. You are so good Jackie. I love your ideas!